The Awards Day for the 3rd 9 Weeks is Monday, April 8th during your child's specials time! Please check for notification from your child's teacher! Ferm pick up is THIS Friday, April 12th in the CO parking lot! Officer Steve Day is THIS FRIDAY, April 12th! Be sure to send your kiddo with whatever special treat that you had originally planned! The Awards Day for the 3rd 9 Weeks will be Monday, April 8th, during your child's Specials time! Please look for notification from your child's teacher, if your child is receiving an award! Carroll-Oakland's 2nd Annual Daddy Daugher Dance will be Friday, March 29th from 5-7 PM in the gym! Pre-registration was required, and no tickets will be sold at the door. Carroll-Oakland's Pre-K Registration will be Tuesday, April 2nd from 7:15-2:15 PM. Thursday, May 9th at 3:00 P.M., we are inviting former CO graduates back to school! 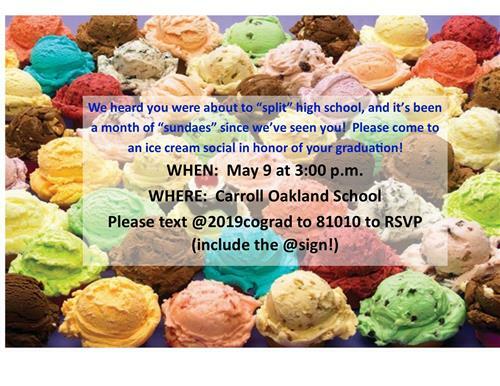 If you are a graduating senior, and you attended CO, please come back for an ice cream social in your honor! Fern Pick-Up is Friday, April 12th in the CO parking lot! Friday, April 12th is Officer Steve Day! Please be sure to send whatever goodies that you had planned on sending in for him! Monday, April 8th is the 3rd 9 Weeks Awards Day in the CO gym! Please check with your child's teacher to see if they will be receiving an award!